My baby is going to be 5 tomorrow! I have no clue where the last 5 years went. :o( She was so excited for school today, she took cupcakes in to share with her class, then tonight she took cookie cake to Daisies (Missionettes) at church. Today she had a chef salad with lettuce, turkey, cheese & carrots (hoped to have an egg in there but we didn't have any ready). The top tier has mandarin oranges, ranch dressing in the HK container for her salad, some panda & koala cookies and a yogurt jelly. I had no idea you were Christian! We go to an A/G church. 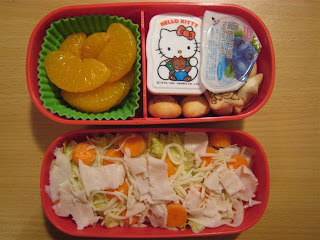 I love the idea of putting a salad in Abby's bento. I wonder if she'd eat it? She loves to eat them at dinner. Do you just package the dressing on the side?